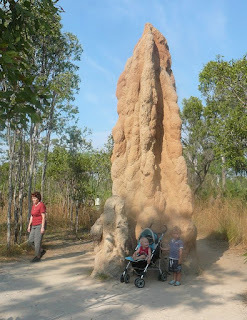 Had a quick walk through the termite mounds the other day. Bloody huge tall things they are. 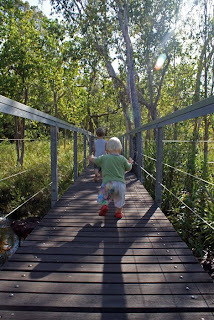 And i foolishly decided to head to Wangi with the boys to find a geocache that is there. 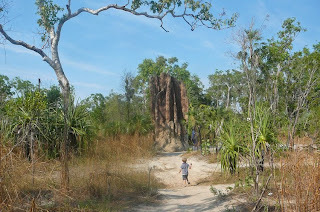 I just thought it would be a quick early morning walk as i expected it to be in the main touristy area and so nice and easy. So i just stuck Darcy in the pram and Jordy was just wearing his crocs instead of his sneakers. 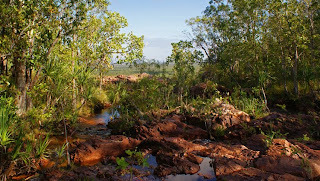 We got down to the main water hole and the GPS said the cache was about 300m away. 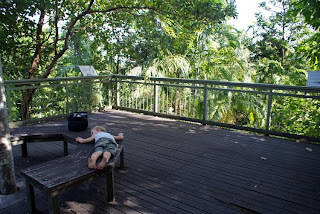 So we wandered down to the next viewing platform... GPS still said about 300m away.... so i figured we'd just wander up the track a bit and have a look... anyway, long story short here is Jordy having a rest in the tree house half way up the mountain. And the view from the top of the waterfall. Yep, we actually walked the whole way around the side of the swimming hole and up, up, up, up to the top of the range where the falls start. 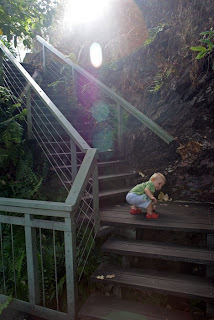 And of course you could not take a pram up the steep track so i carried Darcy the whole way and Jordy, the champion, climbed like a billy goat loving every minute. For the record we did not get to the cache. But now that i know where it is i will go better prepared (and alone) next time! Although Jordy has asked to go back to the treehouse... so maybe i will just leave Darcy at home.